There are two ways of installing merlin: through opam and manually. If you do not wish to try the development version, it is recommended to install merlin through opam. Keep your existing tuareg-mode or caml-mode configuration. Merlin doesn't provide syntax highlighting nor indentation. It is a minor mode that can be enabled on top of one of the existing OCaml modes. It will add completion, navigation, etc on top. merlin-mode can also show you errors, but flycheck users might prefer https://github.com/flycheck/flycheck-ocaml to ensure errors are always shown. It should download and install the last release of merlin. To check that merlin is indeed installed (and that you have a well configured opam) you can try to run ocamlmerlin. Then whenever you start emacs, merlin will be loaded. Try it by issuing (in emacs) M-x merlin-version. It should display the version of merlin you are using. You can now skip the next section and play with merlin. You can specify any path for the prefix, and merlin will install itself in this directory (the default being /usr/local). You can now run ocamlmerlin to check if the installation is successful. where <PREFIX> is the prefix you specified to the configure script of merlin in the previous step. You can now restart emacs and check if that worked by executing M-x merlin-version. if you are using the caml-mode. 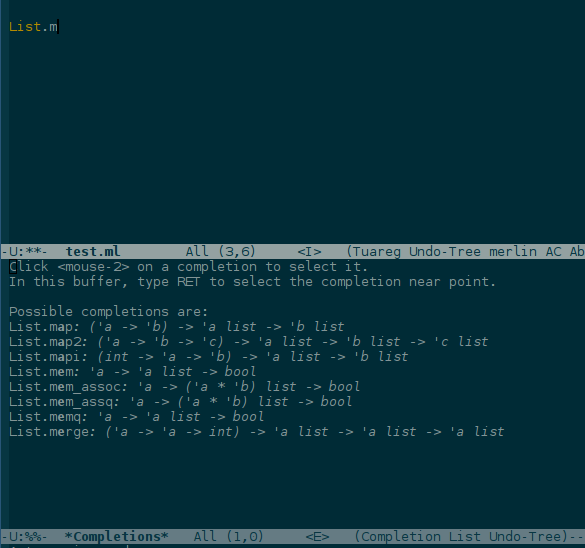 Merlin works by running its own typechecker on your buffer. Synchronization is done automatically when you save your buffer, and when you call a command. When calling a command, emacs and merlin reconcile their view of the buffer so that merlin always have fresh information to answer your query. Upon saving emacs will ask merlin about all the errors (of syntax or type) in your buffer and report them. If your buffer contains error the erroneous chunks of the buffer will indeed be highlighted and emacs will display markers in the margin (! for errors, ? for warnings'). You can jump to errors using the merlin-error-next command (C-c C-x by default). auto-complete: a fancier completion system, installed by default on emacs 24, and available on marmalade. company-mode: available on melpa, an alternative completion system (with a saner default configuration). Completion using completion-at-point should work out of the box. To try it, type List.m followed by M-x completion-at-point (bound to M-tab by default in emacs 24), it will display a completion buffer with the different candidates and their types. it will enable auto-complete in merlin buffers and add the merlin source to the default sources. You can now use auto-complete as you usually do, or run M-x auto-complete. If you have not configured auto-complete, see its documentation. If you want autocomplete to suggest completions without prompting, simply replace 'easy with t in the above setq. And then it should work out of the box. See the documentation of company mode for more information. To get the type of ident under the cursor, call merlin-type-enclosing (bound to C-c C-t by default). It will highlight the ident and display its type. You can then call C-<up> (and C-<down>) to climb the typed tree and see type of bigger expressions surrounding the cursor. If there is an active region, it will instead display the type of the region. Further calls to C-c C-t will improve the verbosity of the displayed type, by expanding aliases. Also, note that merlin-type-expr (C-c t by default) will prompt you for an arbitrary expression and will try to type it in the context active at your cursor position. You can navigate between phrases of your buffer using merlin-phrase-next (C-c C-n) and merlin-phrase-prev (C-c C-p). Merlin also provide a way to switch between files of your project using the commands merlin-switch-to-ml / merlin-switch-to-mli, these will prompt you for a (toplevel) module name, and will then open the associated ml[i] file. And last but not least : the command merlin-locate (bound to C-c C-l by default) when called on an identifier will try to bring you to the place were it is introduced (i.e. defined or bound). You can also use that facility from auto-complete completion menu; issuing C-c C-l when that menu is open will call the locate command on the highlighted suggestion. or you didn't compile with -bin-annot. If it doesn't work, but none of the above explains why, open an issue! See project configuration for a full description of .merlin files. You can use the merlin-use command to tell Merlin that you're using a findlib/opam package. This will prompt you for a package name (completion on packages name is provided, but you can always call ocamlfind list from a shell to have the list of installed packages). This is equivalent to the PKG directive in .merlin. You can enable syntax extensions with M-x merlin-extension-enable. This is equivalent to EXT in .merlin. It happens that merlin and emacs get desynchronized. In this case, you can always issue merlin-restart-process to start from a fresh state.